Excellent with coffee, these little almond biscuits from Turkey and the Balkans are quick and easy to make. Mix 400g of ground almonds and 150g of golden caster sugar together and add two or three drops of almond essence and two tablespoons of rose water. Bind the ingredients together with two lightly beaten eggs, and work until the dough is smooth. Roll walnut sized balls of dough, place on a greased baking tray and flatten slightly with your fingers. You should get about thirty biscuits. Bake at 180c for twenty-five minutes, but keep an eye out to prevent the edges from burning. A fascinating and authoritative glimpse into the untold culinary riches of the Jewish world, this is a serious and important book, with some stunning recipes. Roden understands the collision of food and culture perfectly and shows clearly how each make the other. These look so much like the semolina biscuits of my childhood, though I think they're probably more exotic tasting. Love the inclusion of rose water. These do sound so amazingly lovely with a cup of afternoon tea! They look delicious really.I have Claudia Rodens book of Middle Eastern cooking. I have tos ay everything comes out real nice from her book. 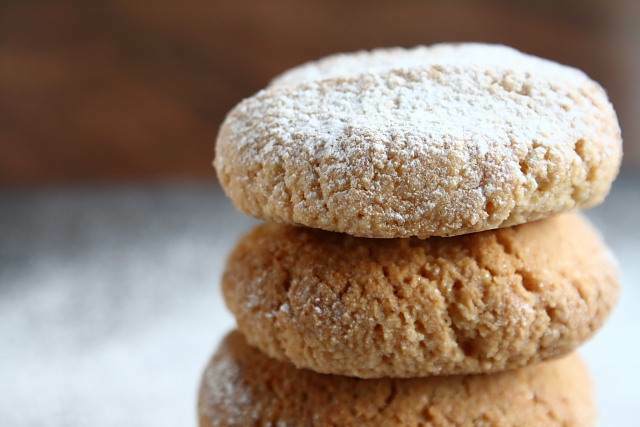 i love almond cookies; i will have to try these. Thanks! Hope your friends like it.